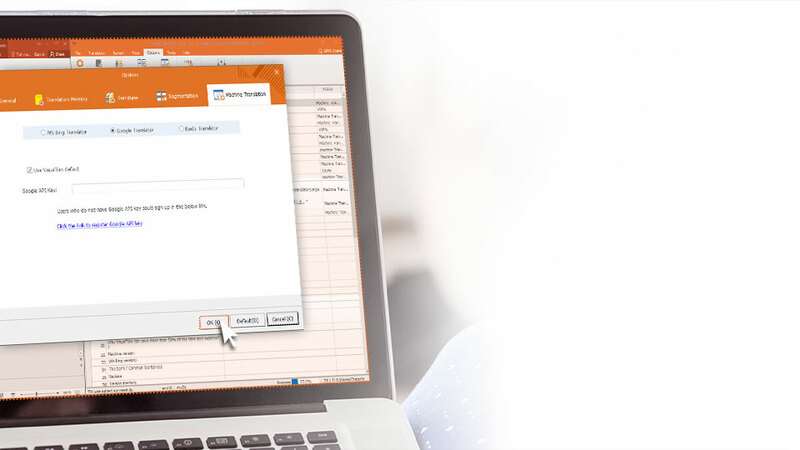 Now, translate MS Office documents, including Word, Excel and PowerPoint files, with VisualTran. Quick and easy translation functionality can be enabled through a complete link with MS Office. Automatic translation is supported through MS Bing and Google Translate. Translated content is presented in real time without any change to the original document. 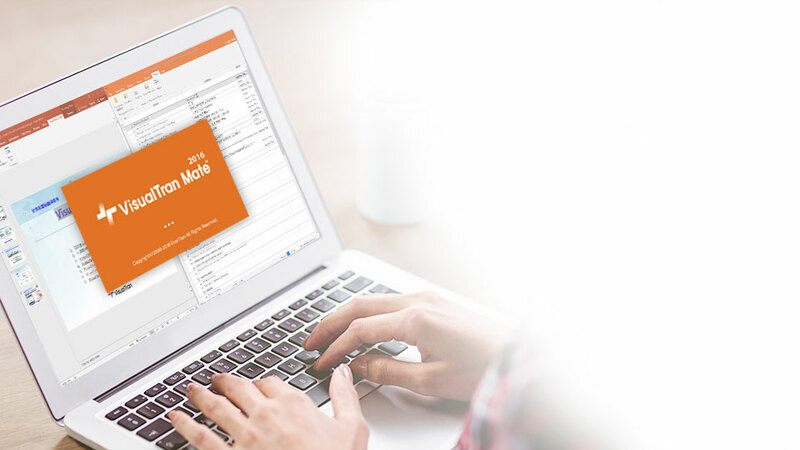 Extensive support is provided for MS Office, from 2007 to the latest 2016 version. VisualTran is an Alliance Partner of Microsoft translation. 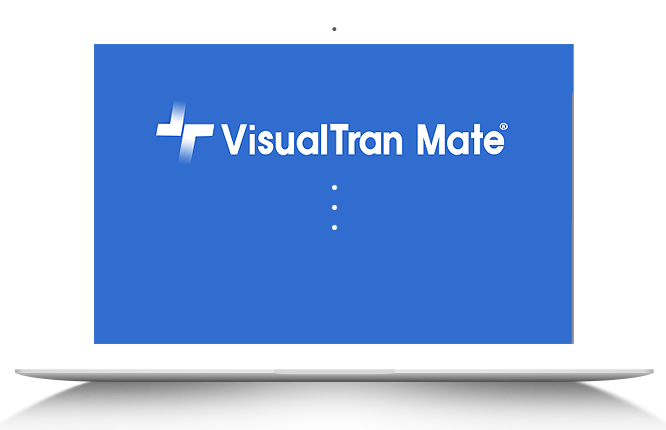 VisualTran enables easy and quick translation. 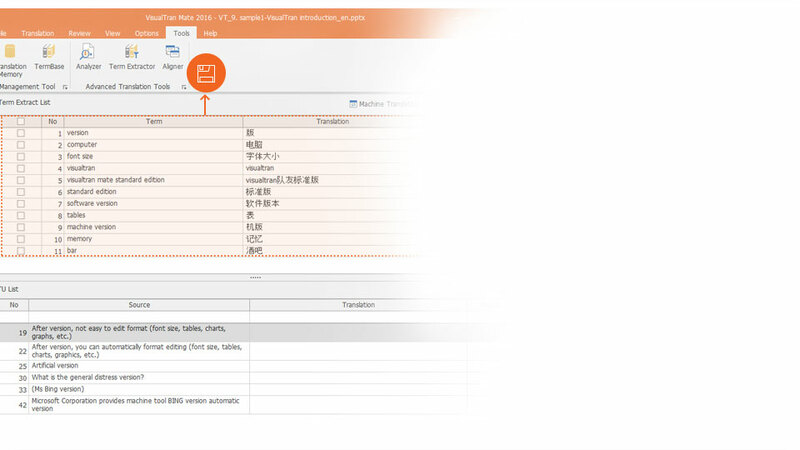 VisualTran supports translation with a variety of functions. 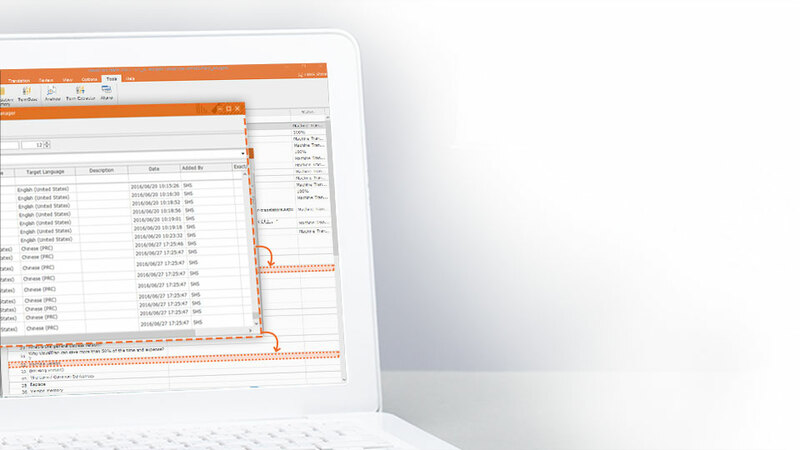 VisualTran works in complete compatibility with MS Office. 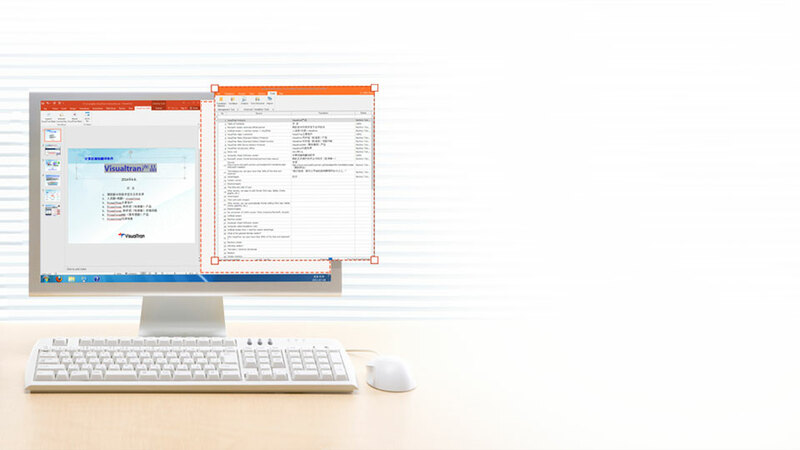 VisualTran is an Office translation support program that can be attached to MS Word, Excel and PowerPoint. It will appear in the ribbon menu, providing a variety of functions needed to translate Word documents, Excel worksheets and PowerPoint presentations. The VT file generated contains both the original text and the translated text, in standard MS Office file formats. 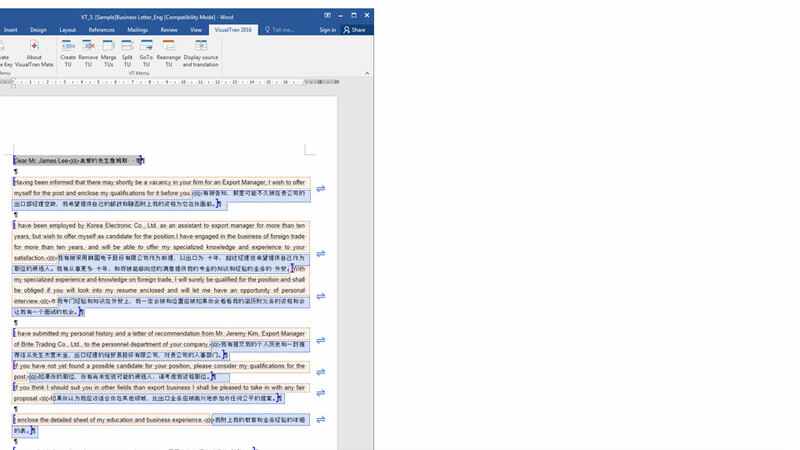 Opening this document with Office and executing VisualTran restores the original text, enabling you to continue your translation work. One-click, automatic translations can be enabled through MS Bing, Google and Baidu translation services. 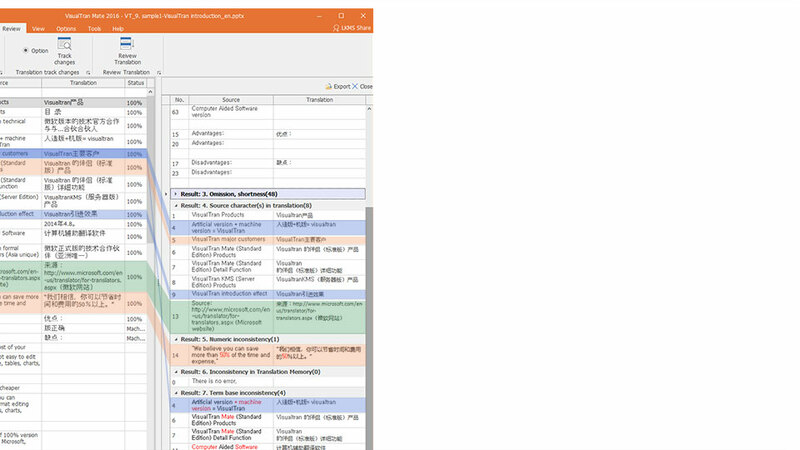 VisualTran enables you to easily take advantage of the machine translation services provided by MS Bing, Google and Baidu. If you have your own glossary, this can be applied during the machine translation process to produce improved results. Translations can be reused through the translation memory function. VisualTran saves translated sentences along with the original sentences to generate a database. This enables you to easily build up translation knowledge and reuse translated text through methods such as complete match, fuzzy match, etc., improving the efficiency of your translation work. The glossary can be utilized to maintain consistency in translations. The glossary allows for the individual registration of needed terminology during translation work; it uses an Excel sheet to generate a database of the needed terminology and relevant meanings, automatically searching for required terminology during translation to display a suggested meaning in a distinctive color. This results not only in improved translation quality but also in reduced work time. 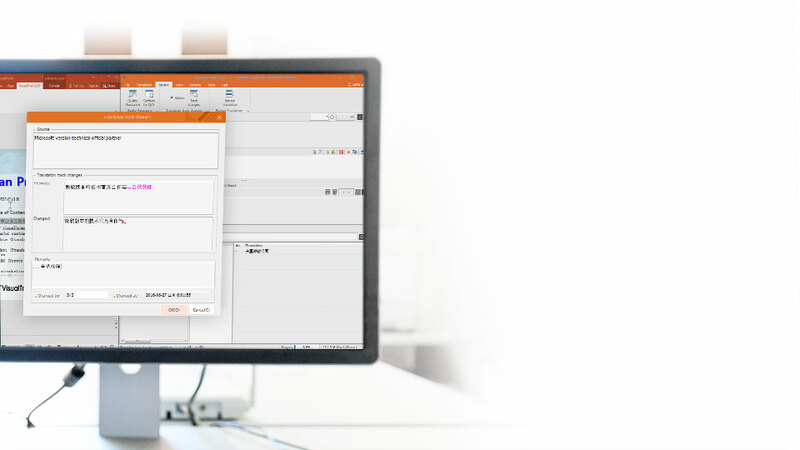 Translation time can be reduced with the document analysis function. This function generates Translation Units (TUs) from the original document and performs a document analysis function to extract reusable TUs for the translation memory. Redundant TUs in the document and TUs not requiring translation are identified, thereby separating the TUs requiring translation from irrelevant parts and reducing translation time as a result. The glossary is built up with the terminology extraction function. The terminology extraction function is used to extract phrases from the original document according to frequency of use. If you register extracted terms in the glossary along with their translated meanings, machine translation services available via Bing, Google or Baidu can apply these terms to translation results, maintaining consistency among translations. 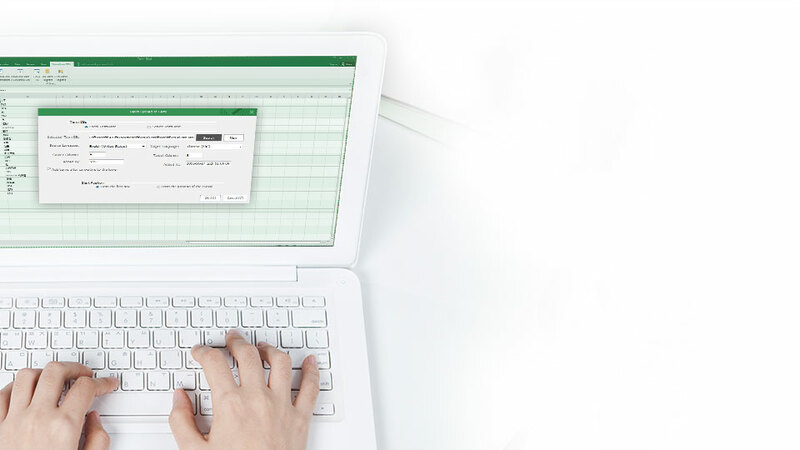 If correction work is done after a translation is complete, the corrected translation and correction date, etc., are saved in a VT file, and the translation correction history for each document is exported in Excel file format. Translation errors can be corrected with the translation verification function. After translation is complete, possible translation errors are suggested with 9 types of translation quality assurances, including translation match, terminology match, number and symbol match, spelling check, etc., and an easy-correction function is provided. The original and translated texts are simultaneously displayed after translation. After translation is complete and the work has been saved in a VT file, a TR file-saving function is used to generate a TR file containing only the translated text and a TS file containing both the original and translated texts. Translation time can be reduced by at least 50%, and translation quality can be improved by at least 30%. When translating MS Word, Excel and PowerPoint documents, various functions for translation are offered while maintaining the structure and format of documents to save time on editing, etc., resulting in at least a 50% reduction in translation time. In addition, the translation memory, glossary, translation verification function, etc., contribute to a translation quality improvement of 30% or more. 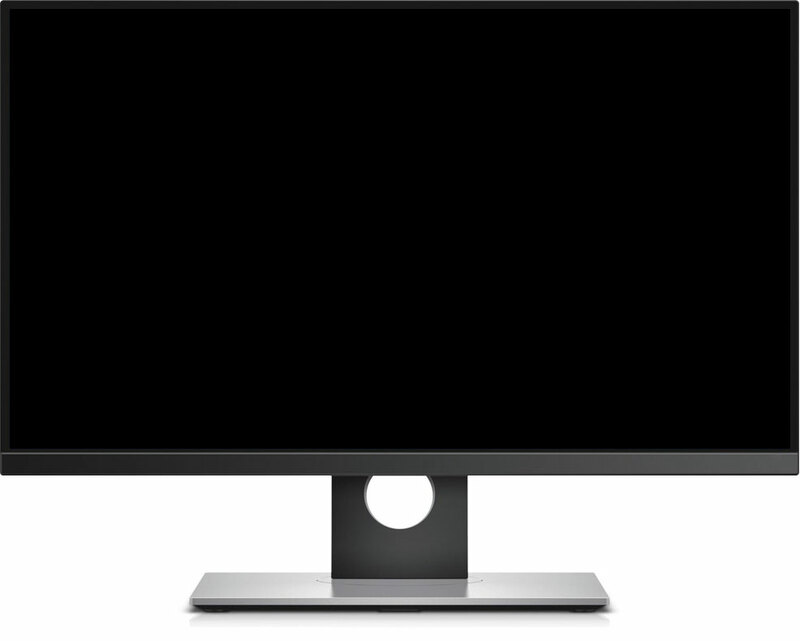 It works in complete compatibility with MS Office. One-click, automatic translation can be enabled through MS Bing, Google and Baidu translation services. Previous translations can be recalled using the translation memory function. You can build up the glossary using the terminology extraction function. Translation errors are corrected via the translation verification function. Original and translated texts can be simultaneously displayed after translation. Many companies have already adopted VisualTran. Translation jobs at our organization have seen a time savings of at least 50% and a translation quality improvement of at least 30%. The savings in translation time and improvements in quality enabled by VisualTran have doubled our income. Using VisualTran has helped us to significantly improve the productivity of our translators. Using VisualTran has helped us to significantly improve our translation quality by cumulatively building up a tailored translation memory and glossary. You can experience it freely for 7 days. Download your 7-day free trial. VisualTran can meet your needs with a variety of plans. * VisualTran is not independently executable: it is plug-in software for the MS Office programs Word, Excel and PowerPoint. * VisualTran is dedicated Microsoft Windows software. Please inquire separately about Enterprise Plans for corporations.